Today I went to Gloucester with a dear friend, the artist Anne Bate Williams. We went to see the newly opened Crucible 2 exhibition of sculptures, which is set in and around this beautiful medieval Cathedral. It was a warm, sunny day which made the experience even more enjoyable. There were small groups of people around the Cathedral enjoying their lunchbreak. Some were eating, some taking photographs and some rebellious types sitting on the sculptures! The first sculpture we saw was a huge arm with a giant hand stretched upwards in a grassy space behind the Cathedral. This is “Reach for the Stars” by K Armitage. At the front there were some of confusing sculptures called Battersea 11 and 111. But the huge “Sitting Couple on bench” by Chadwick was beautiful. 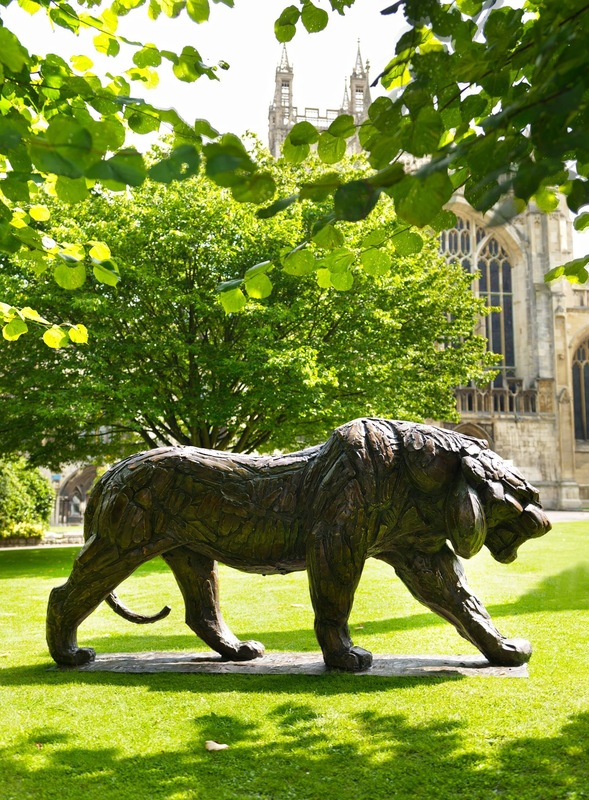 Cleverly placed in the beautiful grounds around the cathedral where children and passers-by can see them, are wonderful lifelike sculptures of animals including a giant bull, a beautiful hippo and its baby, “Siberian Tiger” by Bugatti, as well as “Tortoise” and “Snail” by Cooper. It was wonderful to see little children climbing onto the sculptures and I wondered if they expected them to move. We were already impressed and excited before we even entered the Cathedral. But once in the entrance, we were greeted by an arresting sculpture called “Pilgrim”, by D Backhouse. The body is shrouded in white but the face is stunning in its beauty. I won’t bore you by describing every one of the 100 sculptures, but I will add a link so that you can see some of them yourself. If you do live close enough to get to the exhibition, which is free, I would encourage you to come along. It is on until 31st October and it will be worth the journey. There are over 60 artists represented here. Some are world famous like the local Damien Hirst, Henry Moore, Lynn Chadwick, Antony Gormley and Kenneth Armitage. But there are lots of less well known artists too. This entry was posted in Art, Cotswolds, Creativity, Photography and tagged Gloucester Cathedral. Bookmark the permalink. ← Banksy ~ A rebel with a cause? Glad you enjoyed it Sherri ~ lovely to hear from you, I’ve been out of touch for a while!